If your business sells a physical product, then you need to be able to get that product to your customers. As high delivery fees are the biggest cause of abandoned shopping carts, it’s important to choose the right e-commerce shipping options for your business. In an extremely competitive market, this requires a fine balance between what the shipping service costs you and what it costs your customer. Let’s look at how to manage that balancing act. The first step is to decide what you want to achieve with the shipping options you provide on your e-commerce site. This can be many-layered and apply across your business or just to certain categories or products. Offer a reliable service: Ensure their goods get delivered according to their expectations. Expand your target market: You could provide specific services, like delivering to remote areas or internationally. Make sure you’re clear on what you’re aiming for before proceeding any further. You want to make sure you’re putting your money where it matters. Product type: Are your products particularly heavy or unusually shaped? Are you sending bulk orders of robust items or just one small and light yet sensitive product? Product price: You may be able to include shipping costs in the cost of a high-value product, but not in cheaper or more competitive ones. Product uniformity: If there is a large variance in size and weight across your product range, your shipping costs will be irregular and need extra careful planning. Your customers: Your customer segments should tell you whether they care more about getting their product quickly or getting it cheaply. Tracking and insurance: Does the value of your products warrant this? Do your customers expect it? Shipping routes: Where are your products produced and stored – in one place or many? Do you ship locally or internationally (if internationally, be aware of any restrictions or extra customs costs)? Your e-commerce competitors: What’s their delivery strategy and what can you learn from it? How does it contribute to your customers’ expectations? Make sure you know exactly what the weights and dimensions of each of your products are, so your courier rates are accurate. Reduce your shipping costs by optimising your package sizes, i.e. making them as uniform and or as small as possible. Run the numbers: Don’t just guess your figures or work on trial and error – you may end up eating into your profit margins or having to change your policy later on, potentially damaging your customer relationships. Rather use exact numbers and run some financial models to help you make the best choices around your e-commerce shipping options right up front. The customer is key: Your e-commerce shipping policy and costs should be clear and easy to understand, and they should never get in the way of your customer converting. Surprises when they get to the payment page are only going to lead to abandoned carts. 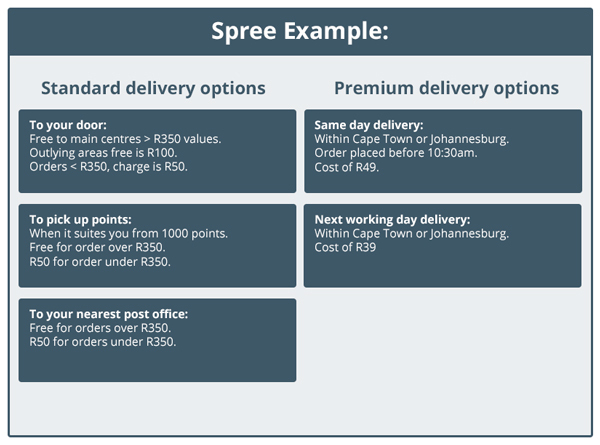 Each of the four popular shipping strategies below describes a different way of charging the customer. They can be used alone or in combination with each other. If you sell luxury goods, you may be able to increase product prices to absorb shipping costs. This obviously won’t work if your products are extremely competitively priced to start with or your customers are price sensitive. Offer free shipping for specific products with large profit margins or for order totals over a specific amount, thus encouraging customers to buy more. Then use the profits to help subsidise shipping rates and cover your costs. Partially cover the shipping cost by increasing product prices slightly, while offering the customer perceived lower shipping rates. Here the customer pays one shipping rate regardless of what they buy or where they want it delivered. It’s popular with customers because it’s simple and they know exactly what they’re in for, especially if you advertise it prominently on your site. This method could work for you if your products mostly fall within a fairly narrow size and weight range. Working out the average shipping cost across your products will give you the flat rate. You may lose a little while shipping a slightly heavier product or to an outlying area, and then gain a bit on another lighter, closer delivery. As long as it balances out though, it’s workable. It’s also often a good way to start until you’re able to work out a more accurate method. In this method, the shipping cost is calculated from a table, based on rules you have set up. The rules are embedded in your chosen website software and executed on each checkout. This should help cover your costs, especially if you offer a large variety of different products or you ship to far-ranging areas. The rules you set up can be as simple or as complicated as you choose. They may take into account order value thresholds, geographical zones, volume and weight, and also include a combination of various other shipping options. Your chosen website software should make your life easier – ask us about this. Be sure to make the shipping rates simple for your customers to understand. Customers need to know upfront how much they will be paying, so they’re prepared and willing when they get to check-out. 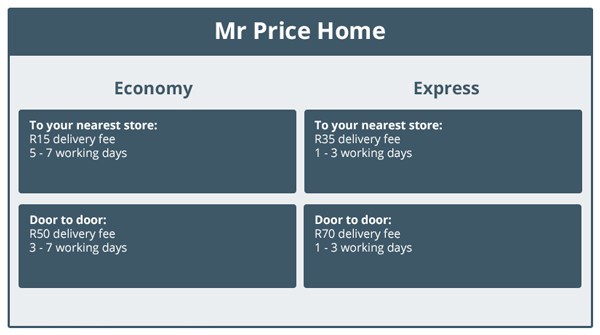 Do your financial homework using real courier rates and delivery scenarios. Use these figures and a combination of free shipping, flat rates and courier rates to compile shipping table rules that cover the costs involved for your business. Make this very clear and easy for your customers to understand. Compare this with what your competitors are offering. If getting a product from you costs the customer much more than getting it from your competitors, your business won’t last long. Automate the entire process from checkout, through scheduling pick-up, generating labels and waybills, to billing, tracking (where available), delivery and much more. Tip: Be sure to indicate current shipping promotions above the fold on your homepage. Tip: Create a detailed shipping policy up front for your e-commerce business. This will force you to do the necessary calculations and help you think things through. Then put a link to it on your homepage so customers can easily find it too. The mix of shipping options available. Bringing all these together will give you the best solution for your business. 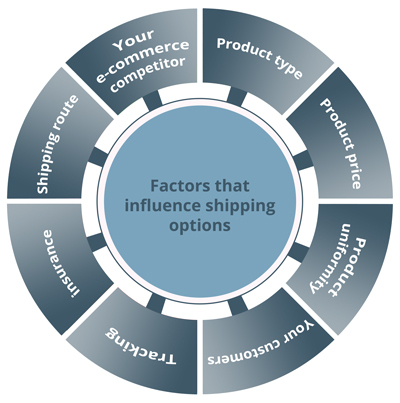 Shipping strategy is crucial to your e-commerce business. Charge too much and you lose customers – charge too little and you may not be able to cover your costs. Get this balance right, and you could boost your sales while minimising your costs. And more importantly – don’t surprise your customer, state your fees up-front. Have high shipping costs caused you to abandon a shopping cart? What would have changed this and encouraged you to complete your purchase?